There's No Market For GOP Health Care Bills Republicans have been criticized for denouncing Democratic legislation without offering alternatives in the health care debate, but many say their proposals are simply not being heard because Democrats control both houses of Congress. With only a few exceptions, this year's health overhaul debate has been pretty much an all-Democrats affair. That's left a lot of Republicans on Capitol Hill steaming. Republicans have written health bills, and they do generally agree with Democrats on some things, such as curbing insurance companies' ability to exclude people because of pre-existing health conditions. However, none of the Republican proposals include an insurance mandate, and many analysts say most of the Republican bills simply wouldn't do all that much to change the situation. "What's your answer? What's your solution?" he asked the cheering crowd. "And you know what? They don't have one." In response, Rep. Tom Price of Georgia, who heads the conservative Republican Study Committee, suggested that members bring their bills to the House floor for the president's speech to Congress last week. "[I] asked them to hold those things up in an effort to try to bring some attention to the fact that the president has been misrepresenting the facts on this, as have most of the media," he said. 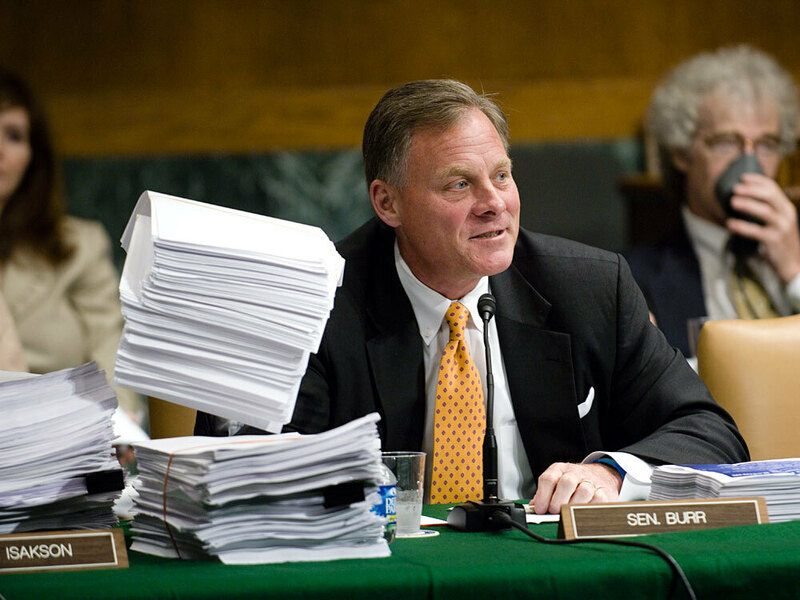 Richard M. Burr (R-NC), surrounded by copies of a proposed bill, during the first day of the Senate Health, Education, Labor and Pensions markup of comprehensive health care legislation. Price is pushing his own bill, which includes tax credits to help the uninsured buy coverage, along with medical malpractice damage award caps, special pools to help those with pre-existing conditions get insurance, and other proposals that Republicans have been pushing for years. "It disputes the notion that there are only two alternatives — that government is in charge or insurance companies are in charge — and says that no, we can move in the right direction, and that is to put patients in charge," Price says. In the Senate, North Carolina Republican Richard Burr was one of the first to offer a comprehensive alternative to what the Democrats are pushing. His bill includes no new taxes and no mandates. But it would call for major changes to private insurance rules and the Medicaid program for the poor. Burr says he thinks there's still room for common ground between the parties. "There's an architecture for bills that could pass literally in a week, that deal with insurance reform, that deal with some type of malpractice limitations, that deal with the ability to bring health care costs down," Burr says. But many analysts say most of the Republican bills simply wouldn't do all that much to change the situation. "This is not anything but window dressing on the gaping problem we have with the uninsured and the serious problem of cost growth. This is not gonna solve the problem," says Len Nichols of the New America Foundation, which works with Democrats and Republicans. Even if Democrats and Republicans do generally agree on things like curbing the ability of insurance companies to exclude people because they have pre-existing health conditions, Nichols says, legislation to do that by itself would be vehemently opposed by the insurance industry. And for good reason: Insurers don't want people to be allowed to wait until they're sick to buy insurance. "You can't require insurers to take all comers, which is the fundamental linchpin of insurance reform, unless everybody comes," he says. "And the only way to do that is to have a mandate, and the only way to do that is to be willing to provide subsidies for the low income population." And once you begin to provide subsidies, you have to either add to the federal deficit, or else raise money for them, which means cutting spending or raising taxes — all things Republicans are ferociously resisting. In the end, says Nichols, with a few exceptions in the Senate, that's left even Republicans who know the health care system is broken without a way to seek much of a solution. "I think they're trapped in a cul-de-sac of their own making. They really do have a problem in that no serious solution to our health system's problems can be concocted without some more government involvement," Nichols says. Many Republicans, however, still insist that the system can be fixed with market solutions alone. It will be at least a few years, however, before they get a chance to try to prove that again.